Ring in the New Year at Osha Thai - Embarcadero! 9PM - 2AM, December 31st, 2018 | 21+ ONLY | Tickets are non-refundable. Grand buffet stations with upscale Osha Thai dishes, premium cuts of tomhawk steak, coast-to-coast seafood/oysters, desserts, plus many dishes exclusive to this event. Complimentary cocktails, beer, and New Year’s Eve toast. Best Embarcadero view of fireworks in the city of San Francisco. Join us at Osha Thai in Embarcadero Plaza, and ring in 2019 at one of San Francisco's best locations for fireworks on the Bay. This year's event theme is One Night In Thailand. Experience the unmistakable atmosphere of a night out in Thailand with numerous booths offering house cuts of our Tomahawk steaks, coast-to-coast seafood and oysters, Thai street food, and a sweets and shaved-ice station. 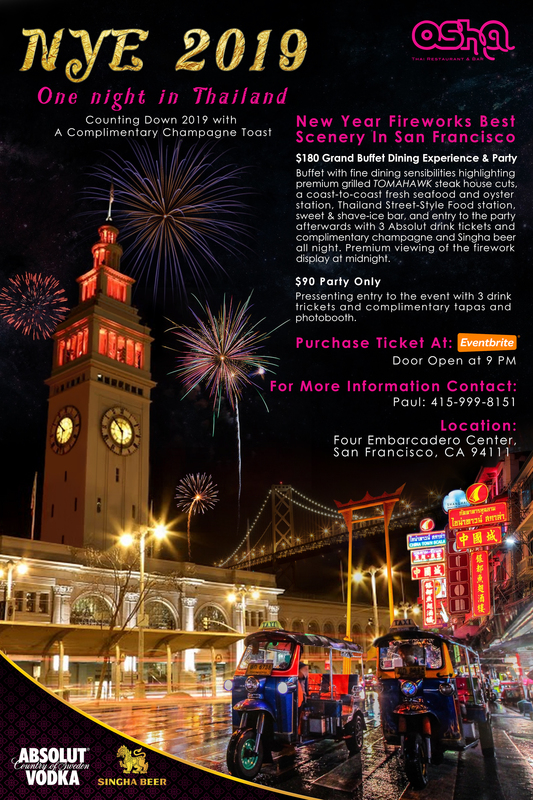 Your dinner ticket also includes admission to the after party with three Absolut drink tickets, complimentary champagne & Singha beer during the countdown, & the best view of the fireworks display in SF! Osha Thai on Embarcadero has become a go-to party destination for NYE. We elevate our already amazing menu of Thai dishes once a year for this occasion. After cocktails, dinner, and fireworks, come party in the stylish Osha Lounge till 2AM with DJs and a private bar. Reservations are mandatory, the entire complex is only available to New Year’s ticket holders in order to ensure plenty of room and a true VIP experience. Tickets are available now! Cabs, MUNI and BART are also easily accessible, only steps away.